Sudden Oak Death (SOD) is best understood in the larger context of the role of tree disease in the forest. The organisms involved in the disease, including the pathogen Phytophthora ramorum, as well as associated secondary insects and fungi, must also be understood as interacting components of the forest ecosystem. In order to develop management strategies, many ecological questions must be answered: Is this pathogen a native or introduced species? If it is introduced, what is its role in its native habitat? What are the tree’s defenses against the invading organisms? 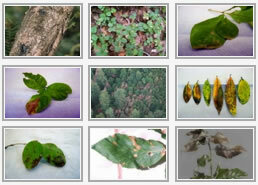 What species of plants are affected by the disease? Do some plants have genetic resistance? How will a shift in dominant tree species affect the overall ecology of the forest? How does climate affect disease progression? How does the disease differ in urban and forested areas? Attempting to answer these and other questions reveals the complexity of disease. Understanding why trees die is often not as easy as establishing a simple cause-effect relationship. Dying oak trees is not a new phenomenon. Trees die due to a wide variety of abiotic (non-biological) and biotic (biological) causes. Often death is a result of an interaction of many factors. Abiotic causes can be anthropogenic (human-caused) or natural. Examples of anthropogenic factors are habitat destruction, pollution, and poor cultural practices that create unfavorable conditions for trees. Natural abiotic factors that can damage tree health include mineral deficiencies in the soil, as well as climatic stresses such as extreme temperature or moisture conditions. Biotic factors are often the more easily observed causal agents of tree decline. These include insects, such as defoliators and bark and wood borers, nematodes (parasitic worms), bacteria, viruses, and fungi. While attention is often focused on the damage done by the more obvious biological agents, it is important to realize the role of abiotic factors, especially in the urban environment. Trees in the urban landscape are stressed in many ways that compromise their vigor and make th em more susceptible to disease. Street trees must cope with high levels of air pollution in addition to soil conditions that are not conducive to optimal growth. The soil around trees in high-use areas becomes compacted over time and this reduces the soil’s ability to hold the water and air that are essential to a tree’s roots. Even in natural woodlands and forests where the stresses associated with human activity are largely absent, adverse environmental conditions, such as drought, can be important factors affecting the health of trees. Tree death is often best explained in terms of environmental stresses that predispose trees to being attacked and killed by secondary agents. However, in the case of Phytophthora ramorum, it does not seem that any pre-disposing stress is necessary for infection. This is a very aggressive pathogen and can infect and kill otherwise healthy trees. Fungi are mostly known for their role as pathogens (disease-causing agents). 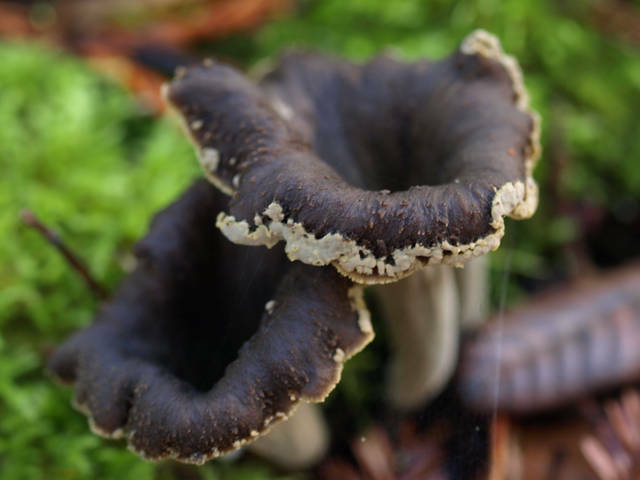 However, fungi are an integral part of the forest ecosystem and are essential for the overall health of the forest. Many types of fungi do not cause disease at all, but rather cause decay of dead organic material. In this way they act as recyclers, breaking down logs and leaf litter and returning their constituent nutrients to the soil where they are taken up by growing trees. Another group of fungi, called mycorrhizae (“fungus-root”), form beneficial associations with plant roots, increasing their ability to absorb water and nutrients from the soil. Seedlings of many species would not be able to establish at all in the absence of these mycorrhizal fungi. Even as pathogens, the role of fungi and Phytophthoras can be seen as beneficial at the ecosystem level. Tree death is a natural and necessary aspect of the forest ecosystem. The death of large old trees is necessary for the regeneration of new trees and the continuation of the forest. Death is necessary for life. Tree diseases that attack especially weak trees can improve the overall vigor of a stand. In addition, the death of a large tree in the forest creates a gap in the canopy, letting sunlight reach the forest floor and allowing the regeneration of species that would not otherwise grow in the shade of the tree. Therefore, tree death can improve the diversity of the forest. This is important because diversity confers resilience to a system. Pathogens often have some degree of host specificity, meaning they only attack certain species of trees. A forest that contains only one type of tree is in danger of being completely obliterated by a single pathogen, whereas the damage would be more confined in a forest with greater species diversity. At this point it is necessary to draw a very important distinction between native and non-native, or introduced, pathogens. The benefits of disease mentioned above refer only to diseases caused by native pathogens. Trees that have evolved in the presence of native pathogens have defenses that minimize the damage that can be done on a large scale by any one pathogen. A balance exists between the trees in the forest and the pests and pathogens that prey on them. However, when a new pathogen is introduced to a forest, native tree species are often defenseless against it, and this is the way many epidemics develop. The most famous historical examples of tree epidemics such as the Chestnut Blight and Dutch Elm Disease were caused by introduced pathogens. While it is likely that Phytophthora ramorum (the pathogen that causes SOD) is introduced, it is important to keep in mind that there are many other diseases that affect oaks that have been present in our native forests for a long time. Some of these pathogens can produce symptoms similar to those of SOD. Several species of the genus Armillaria cause root rot in a wide variety of tree species, including oaks. Armillaria infection can be confused with SOD because it may produce similar bleeding symptoms and can also cause rapid death of a tree. Another disease on oaks that is fairly common, especially on coast live oak, is Cryptocline, which produces crown discoloration and twig death. Wetwood is a common condition caused by bacteria that affects many species of trees. Bacterial wetwood causes oozing that could be mistaken for a SOD symptom. Wetwood ooze is more watery and less viscous than SOD ooze and also often has a foul odor. It is especially important to realize that a certain fungus, in the genus Annulohypoxylon, is often associated with trees showing advanced stages of SOD, but the presence of this fungus alone does not mean a tree has SOD. Finally, it should be noted that in addition to the newly discovered Phytophthora ramorum, there are several other Phytophthora species that attack oaks and produce very similar symptoms. It should therefore not be assumed that all dying oaks have SOD. The impact of SOD must be considered in the context of all of the factors affecting tree health. The more we learn more about Phytophthora ramorum, the more complicated the interactions between the pathogen and its hosts, and between the host plants themselves, become. This graphic follows a hypothetical life cycle for P. ramorum. Notice that the spores that infect the oak trunk very rarely come from the leaves of the oak tree, but are more likely to come from the leaves of an adjacent host plant.